Learn how to make a golden Topaz Wrap Bracelet with Swarovski crystal and Nunn Design charms. Take your length of leather and thread your 4 charm carriers onto it. Check how the leather will fit around your wrist and cut it shorter if you need to. Glue your end caps onto either end of the leather. Attach a jumpring to one of your charm carriers and add a feather charm. Repeat this for another charm carrier and add your Nunn Design bird charm to the jumpring. Take your two Swarovski chaton crystals and secure them into the matching gold plated settings. 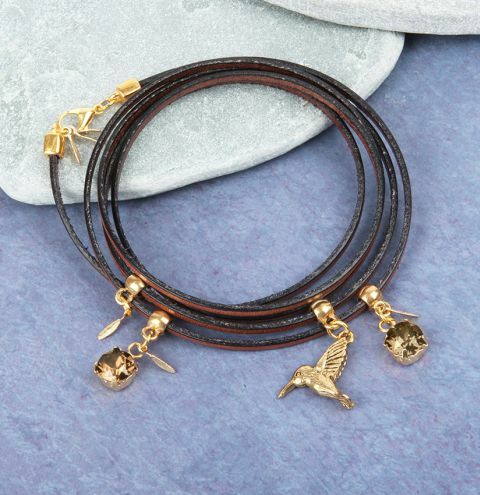 Attach these to the last two charm carriers on your bracelet, along with a small feather charm. Finally, attach a jumpring to each of the end caps on either end of the bracelet. Onto one end, attach a lobster clasp. Onto the other end, attach another jumpring with your remaining feather charms here.